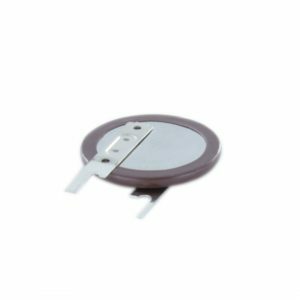 The Panasonic VL2020-1HFE is a 3V rechargeable Lithium coin cell with solder tags for horizontal PCB mounting. It can be recharged approx 1000 times, has a high energy density and continuous trickle charging is not necessary because of a very low self discharge rate of just 2% per year. This Vanadium Pentoxide Lithium Rechargeable VL2020 is a completely new coin-type Lithium battery with vanadium oxide for the positive pole, lithium alloy for the negative pole and a non-aqueous solvent for the electrolyte. One of our customers bought this for his BMW 5 Series ignition key however, please note the photograph as some people want this version but others want the 1VCE version (shown in related products).